“Our first office was so tiny that if you took a step backwards, you fell down an open hole that was stairs to the basement. Now we are a worldwide company with offices in the United States, Canada, Australia and the United Kingdom.” – Alice I. Sullivan, Chairperson of the Collette Board. Back in 1918, when Jack Collette started the company, the first tour to ever run was made up of a jitney bus of travellers that left Boston, Massachusetts headed for Florida. This three-week adventure cost just $68.50! At that time few could have foreseen that nearly 100 years later, that same company would be taking guests from around the world to all seven continents. 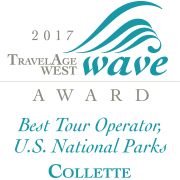 From those humble beginnings, Collette began running tours throughout New England and into Canada. Then, in 1927, the company transferred its base of operations to the New England Transportation Company Terminal in Providence, Rhode Island. In 1945, Dan Sullivan Sr., who had come home from a wartime commission in the U.S. Army Counter Intelligence Division, started working for New England Transportation. Over the next 15 years, Dan and Jack Collette crossed paths often. In 1962, looking to retire, Jack made a decision that changed the course of the company – he sold it to Dan and his brother-in-law, Arthur McWilliam. The timing was perfect. The New York World’s Fair of 1964 was around the corner. Dan ended up taking his family to this historic event and it proved to be a turning point for the company. There, in the shadow of the iconic Unisphere, Dan could see how the world was changing. More people than ever wanted to travel. It was the perfect time to introduce the concept of guided touring. In the coming years, Collette expanded to include tours across the United States and Canada, Europe, Asia, Australia, New Zealand, and South America. Dan’s entrepreneurial spirit carried Collette into a new era, while always remaining true to the things he valued most – personal customer service, convenience and giving back. As his family grew, Dan’s children took on active roles in the company – in sales, tour development, marketing, tour guiding, and in its charitable arm. Working with a team of dedicated employees, they all stayed true to the original vision of expanding travel opportunities for everyone. That tradition continued as Dan’s eldest child, Dan Sullivan Jr., took the reins as President and CEO in 1990 – a role he enjoys to this day. Collette is now a global company. With offices in the United States, Canada and the United Kingdom, its team of dedicated experts are able to cater to the tastes of three distinct groups of travellers. When Dan Sullivan, Sr. purchased Collette it was a small company. Now, Collette employs hundreds of people around the world. So much has changed, but as the company thrives in its third generation of family ownership, the heart and soul of Collette remains the same. Collette is a place full of enthusiasm. Drive. Innovation. And, most importantly, family.